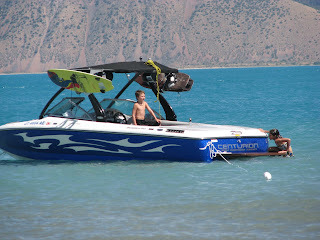 Come join on us at Bear Lake for a day or week of watersports, we bring the professioanl wakeboarding ski boat equipped with surf package for the ultimate surf wave. We will have all the equipment needed for the ultimate watersports vacation. Waterski, wakeboard, Wake surf, Wake skate, tubing, what ever you favorite activity is on the water we are equiped to help you have fun. We take all the work out of the fun, you show up we deliver and opperate the boat do all the clean up you and your group just have fun. We pride ourself in our service. Bear Lake is one of TK Watersports most frequented vacation spots for the ultimate dream Watersports vacation. Rent a Condo or book an RV, Travel Trailer, Motor Home add a boat or wave runner package and receive a discount on one of our popular package combinations. Stay at Garden city or Logan Utah and hit Bear Lake Waterskiing, Wakeboarding, Wake Surfing, Tubing,or knee boarding, on one of our VIP rentals or full service water sports charters. TK Watersports will tow the boat launch and retrieve, do all the clean up, provide all the Watersports equipment you just come and have fun. Charter your rental boat and let one of our professional drivers handle all the work. Avoid the stress and liability of caring for this expensive boat and spend more time enjoying yourself. Our drivers are all very knowledgeable and easy to work with. Certified in Wilderness First Responder and CPR first aid. Bear Lake Boating is a popular activity at Bear Lake. The lake is 20 miles long and 8 miles wide, providing space for many different types of watercraft. There is plenty of sandy beach to play on and the lake is big enough not to be to crowded. Bear Lake is often called the Caribbean of the Rockies for its intense turquoise-blue water. As visitors catch their first glimpse of the lake, they marvel at its color and wonder what makes the lake so blue. The unique color is due to the reflection of the limestone deposits suspended in the lake. Garden City is famous for the Raspberry Days celebration and there fantastic Raspberry Shakes.